The Energizer Bunny folks have introduced a number of products targeted for hunting and the outdoors. 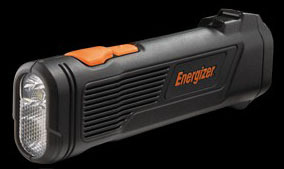 One of their latest offerings is the Energizer Nightstrike flashlight that uses three AA batteries. Its distinguishing features are its light weight, toughness and compact size. The housing is made from magnesium alloy to save weight. It passes the 10 foot drop test and this flashlight is further lightened by use of three Energizer “Ultimate Lithium Batteries” (included) that weigh one third less than alkaline AA batteries. The result is a flashlight with the heft of a two AA light, yet with the power of a heavier unit. The Energizer Ultimate Lithium AA batteries themselves are stated to have an operating range from -40 degrees to +140 degrees Fahrenheit. This a very compact light that measures 5.25 inches long by 2.2 inches wide. Run time is six hours at the max setting that produces 130 lumens of light from two CREE LEDs. It offers spot, flood and spot/flood combo settings. The Nightstrike also has a red Nichia LED with high and low settings, very useful for amateur astronomers. With batteries installed, the entire unit weighs about eight ounces. I like the Nightstrike because of its brightness and compact size. Energizer uses some interesting marketing terms such as “discrete switching,” which apparently refers to the ease of changing modes or beams. It is controlled by two buttons, the larger forward button activating the bright white LEDs, the smaller rearward button activating the red LED that helps preserve your night vision. Though the Ultimate Lithium batteries are lighter than standard alkaline, they do not compare favorably in run time. Alkalines offer 12 hours, while the lithium set is only good for six. For most purposes, I'd stick with regular alkaline batteries. The Nightstrike retails for one hundred dollars, but it is currently available at around $68 or so from Amazon and other sources. I haven't intentionally abused it, left it out in the rain, or dropped it, so I can't tell you how impact-proof it really is, only that it appears to be extremely tough. I'll use it this year on several hunts and update this article as necessary. It has a lot of output for its size and is good enough to be a primary hand-held light for most applications. Suffice it to say that my impression thus far is that it is a very competent product built for rugged use. Copyright 2010, 2016 by Randy Wakeman. All rights reserved.